As a proud institution older than the nation itself, Princeton University has played a significant role in many of the wars of the United States. A key Revolutionary War battle was fought near and on its campus, Nassau Hall served briefly as the nation’s capital in 1783 and then-General George Washington attended commencement that year—facts Woodrow Wilson would repeatedly stress in the early 20th century as he framed Princeton as perhaps the nation’s leading small university and a vital contributor to America’s development. After Wilson’s tenure, Princeton and its students continued to contribute to American war efforts. The school transformed into a military camp during World War One and again welcomed legions of soldiers during World War Two; hundreds of alumni died in service across the globe. Curiously, we know less about Princeton and the Civil War than we do about these other conflicts, which have drawn huge attention over the years. Details are hazy about campus life during the Civil War, the administration’s response to desperately challenging conditions, and even the number of Princetonians who fought and died. Much was swept under the rug in the period following the war: the supposedly unpatriotic attitude of the administration, which drew sharp newspaper criticism, and Princeton’s many former Confederates were sources of embarrassment. But recent years, coinciding with the 150th anniversary of the Civil War, have brought a welcome resurgence of interest in this fascinating topic. But in time Old Nassau was torn by quarrels, along with the whole United States. In December 1859, pro-Southern students marched to condemn “John Brown, The Horse Thief, Murderer, and Martyr” and burned effigies of Northern political leaders on campus, the glow of flames lighting up historic Nassau Hall. Southerners were further agitated by a meeting of African-American abolitionists “in the woods below the college” in 1860, decrying the incursion of radicalism into the sleepy town. The town of Princeton itself was split, given its longstanding ties to the South—the slaveholding Potter family of Savannah, for example, summered at Prospect House, a private estate next to campus. John H. Potter (‘1863), grew up in Princeton and died fighting for the Confederacy; “gentle as a woman, he was brave as a lion,” according to his contemporaries. Potter was originally interred in Savannah, although his body was later re-buried beside his father in Princeton Cemetery. To the horror of white Southerners, the “Abolitionist” Abraham Lincoln won the bitter four-way presidential election of 1860. New Jersey leaned conservative and became the only free state that Lincoln lost, receiving forty-four percent of the vote in the town of Princeton, compared to fifty-six percent for the two Democrats. One of these was pro-slavery candidate John C. Breckinridge, a Kentuckian who had prepared for law school with six months of graduate study in Nassau Hall and represented the Southern wing of the divided Democratic party. An able speaker in pro-Southern Whig Hall, Breckinridge had deep Princeton connections: he was the great-grandson of John Witherspoon and grandson of Samuel Stanhope Smith, distinguished presidents of the college. Later he served the Confederacy as a major general and secretary of war. As president-elect, Lincoln needed to firm up support in this wavering state; he spent seven hours in New Jersey on his way to Washington to be inaugurated, making stops from Jersey City to Trenton. Addressing the state legislature, he reminded members of their patriotic duty by recalling the exploits of George Washington in the Battle of Trenton, about which he had read as a boy. Princeton students cheered Lincoln when his train passed the campus on the railroad then running along the canal at the foot of Alexander Street. Then they caught a following excursion train to Trenton, singing loudly, and jostled in vast crowds to catch a glimpse of the controversial politician whose election brought the tragedy of disunion. 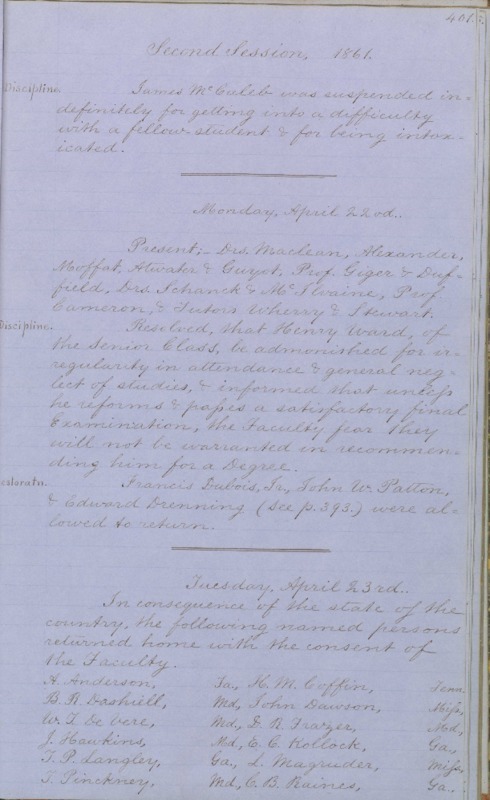 A list of Southern students honorably dismissed from the college due to the outbreak of the Civil War. Fearful of alienating Southern sympathizers who remained—including a vocal New York City contingent—college authorities discouraged patriotic wartime demonstrations. The day after Fort Sumter, Unionists lashed a flagpole to the finial of the Nassau Hall cupola, shouted speeches from the roof, and drilled with Mexican-War-era muskets. But the administration quickly ordered the flag to be hauled down (though it was raised again later). And when three undergraduates ducked a pro-Southern classmate from Brooklyn named Francis DuBois under the campus pump to “wash the suds of secession” off and insure that “the fire of disunion was pretty well quenched in his breast”—an episode still famous today—they were expelled immediately. Newspapers blasted Princeton for being unpatriotic. For all its ties to Southern states and the Confederacy, Princeton made many contributions to the Northern cause—the majority of Tigers being staunch Unionists. Recent research indicates that more than 600 Princetonians fought in the Civil War, more than half of them for the South. Four major generals of the Union Army were graduates, including Samuel P. Carter (class of 1840), the first person to earn both that rank and the rank of admiral in the Navy. And longtime college trustee Governor Charles Olden and his successor Joel Parker (‘1839) mobilized New Jersey troops at the Drumthwacket estate in town. President Lincoln, too, put his faith in Tigers. General Jeremiah Boyle (‘1839) was his military governor in Kentucky, cracking down on dissent. Minister to France William Dayton (‘1825) worked to prevent the French coming into the war on the Southern side right up until his scandalous death in the arms of a Paris courtesan. Lincoln’s emissary Edwin Emerson (‘1849) also assisted Dayton in France. The president’s financial adviser, John A. Stewart, later served Princeton as trustee and acting president after Woodrow Wilson resigned in 1910. In 1926, the 103-year-old Stewart contributed funds to build the University Chapel, the pews of which are white oak cut in 1863 and originally intended for Union gun carriages. Alumni compiled distinguished battlefield records on the Union side. A grizzled veteran of the Fremont Expedition to the Rockies, topographical engineer James Abert (‘1838), namesake for the bird “Abert’s Towhee,” fought in the Valley of Virginia. Charles Phelps 1852 received the Medal of Honor for bravery under cannon fire at Spotsylvania. The name of Colonel Henry McKeen (‘1853), felled by a sharpshooter, was applied to the postwar Western fort occupied by Gen. George Custer before Little Big Horn. Hugh Janeway (‘1861) fought with “reckless bravery and undaunted determination” throughout the war. Wounded twelve times—as he wrote his class secretary—Janeway was fatally shot through the temple on April 5, 1865, four days before Appomattox. Under the leadership of President John Maclean Jr., the college remained open throughout the Civil War, albeit without the Southern students who had once been so numerous. Financial ruin remained a constant worry. Student life centered around Nassau Hall and the adjacent dormitories, West and East Colleges. At the time of the Civil War, Nassau Hall (“Old North”) was a patriotic landmark famous nationwide: it had been scarred by cannonballs in the Revolutionary War Battle of Princeton and had briefly served as the seat of the United States Congress. 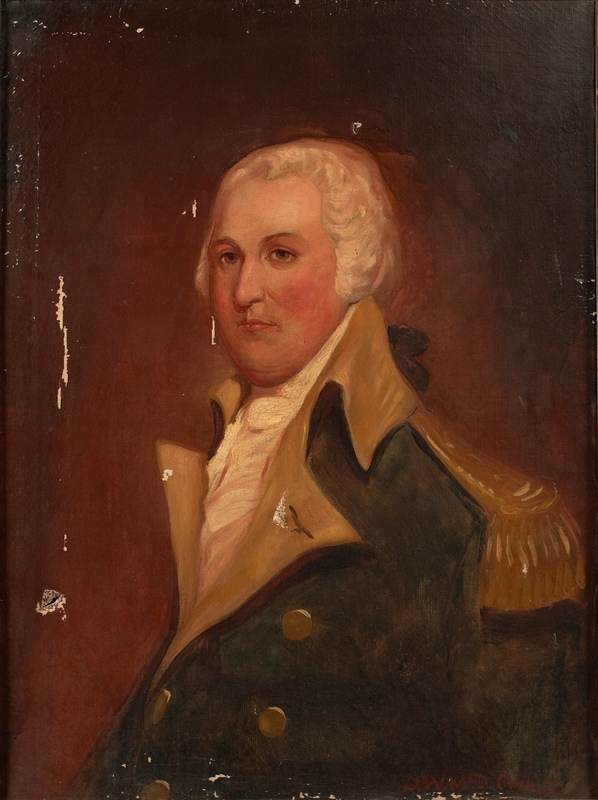 Former student residents included “Light-Horse Harry” Lee (‘1773), father of Robert E. Lee. After a fire, Nassau Hall had been rebuilt in 1855-56 with a taller cupola; during the war freshman began a tradition of attempting to elude proctors and steal the bell clapper from the new tower, a risky custom that lasted more than a century. That faithful bell rang some 35 million times until it finally wore out and had to be replaced—during the Cold War. "Light Horse Harry" Lee ('1773), father of Confederate General Robert E. Lee. My research suggests that students enjoyed special freedoms on Rear Campus behind Nassau Hall. Here the buried Big Cannon from the Battle of Princeton (which dates to the 17th century and was likely part of the British fortification of the town in 1777) provided a focus for patriotic and other demonstrations. Just before the war, Telfair Hodgson (‘1859) of Savannah, Georgia, recalled various scenes in his diary relating to the half-buried gun: undergrads gathering for “horn spree,” preparing to make wild noise around the campus; the “blinding glare” created by a fire after the election of James Buchanan as U. S. president; the way seniors one spring “pulled down shanties and made fires in the campus, got drunk and danced like a set of demons around the cannon.” The administration’s official rules of 1860 outlawed (to no avail) “kindling of bonfires, and disorderly gatherings on the college grounds.” But such gatherings and fires were constant during the Civil War—including at least one pro-Confederate demonstration by a few remaining rebels in 1864. Constant, too, were games of football. Two enormous ash trees by East Pyne, finally cut down in summer 2016 (180 years old at that time, by a count of their rings), were among the dozens of saplings thickly planted on Rear Campus by the early 1850s in a failed attempt to stop students from playing football. As early as 1840, Princetonians played football there, using an inflated cow bladder for the ball and East and West Colleges as the goals. Rear Campus should be legendary in the annals of American sport, being arguably the birthplace of today’s national pastime: the Princeton students who perfected their game there during the Civil War later played the first-ever intercollegiate football game (at Rutgers) in November 1869. The second such contest, a Princeton victory, took place a week later in a vacant lot on Chambers Street in town. Baseball was similarly popular throughout the Civil War, played in a pasture near present-day Witherspoon Hall. When the war began, the state’s leading railroad, the Camden and Amboy, ran along the canal below campus. During the war years, Congress called this “the most traveled and most vital thoroughfare in the Union” but faulted the railroad company for long delays that made journeys “disagreeable, annoying and unsatisfactory.” The Camden and Amboy played a critical role in the conflict as the chief pipeline propelling soldiers and supplies south towards Virginia battlefields. Its line was soon straightened into the route still followed by Amtrak today, with the creation of Princeton Junction and today’s “Dinky” spur line to campus in 1865. Early in the war years, Princeton students could still run down to the railroad to see Lincoln on his way to be inaugurated or watch Union soldiers go roaring past. Near midnight on April 19, 1861, the Seventh New York Regiment came through and undergraduates heard the soldiers’ dramatic “rocket” cheer, still heard today: “ssss-boom-ahhh!” Nineteenth-century students gave the “Tiger-skyrocket” a stately “Hurrah! Hurrah! Hurrah! Tiger! Ssss-boom-ahhh!”—the last syllables imitating a crowd’s gasping admiration of a starburst. In fact, the cheer was merely reintroduced to campus in 1861. The “rocket,” often preceded by the long-customary “three cheers and a tiger,” was used on campus already, perhaps inspired by fireworks displays when the Atlantic Cable—the first transatlantic telegraph cable—was celebrated in 1858. Nationwide, militia groups had popularized the rocket cheer by 1860. Later, in the 1890s, Princeton devised the “locomotive,” which speeds up as it goes along and today is rendered: “Rah rah rah! Tiger, tiger, tiger! Sis, sis, sis, boom, boom, boom, ah!” This gave more prominence to tigers, the school’s mascot since the mid-1880s. For today’s tourist hoping to see Civil War sites, only six buildings survive on Princeton’s campus from that long-ago era: Nassau Hall (former dormitories, classrooms, and library), Maclean House (former home of the college presidents), Stanhope Hall (then Geological Hall), West College (dormitory), Joseph Henry House (which has since been moved), and Prospect House (then a private home). But the appearance of the Civil War campus is preserved in a remarkable series of photographs because Princeton invented that modern staple, the photographic yearbook, which debuted with the work of Massachusetts photographer George K. Warren in 1860. When Richmond fell in the first days of April 1865, presaging the end of the long war, the African American troops who marched into the stunned city were commanded by a Princeton alumnus, Colonel Lucius Warren ('1860). Back on campus, the defeat of the rebel stronghold was celebrated with a torchlight parade and bonfire. After General Lee’s surrender—witnessed by staff officer William Potter (‘1863), who carried captured Confederate battle flags back to Washington—Princeton students celebrated with bonfires at the Big Cannon. But soon after, college buildings were draped in black for the martyred Lincoln, and “WE MOURN OUR LOSS” was etched on a Nassau Hall windowpane. The president’s family doctor, Robert King Stone (‘1842), had stood at his deathbed. A mournful student body marched to the new Princeton Junction station to see the funeral train roll by. The slain president was, in fact, an honorary Tiger: after Lincoln was re-elected U.S. president, Princeton trustees had awarded the former Illinois lawyer a doctor of laws degree. Lincoln’s handwritten reply to President John Maclean Jr. (dated December 27, 1864) is today a University treasure. He expressed gratitude for “this high compliment” from “a body of gentlemen of such character and intelligence in this time of public trial. . . . Thoughtful men must feel that the fate of civilization upon this continent is involved.” Lincoln appreciated “the hearty devotion everywhere exhibited by our schools and colleges to the national cause.” One of Lincoln’s staunch backers, just-retired New Jersey governor Charles Olden, had recently joined the Princeton Board of Trustees when the degree was awarded. Honest Abe never attended college but received three honorary degrees—from Princeton, Knox College in Illinois, and Columbia University in New York. The war had ended, but aging President Maclean worked to rebuild his weakened school. As he had done forty years earlier in another time of financial crisis, Maclean turned to the old graduates. At a big gathering organized in 1866 to celebrate the return of peace, former students formed the Princeton Alumni Association. The college also tried to restore its patriotic reputation. The trustees mandated a June 1866 memorial service for its Civil War dead at First Presbyterian Church—a service which made no mention of Rebels. Honored visitors to campus during Reconstruction included General William Tecumseh Sherman and President Ulysses S. Grant. The authorities thought it necessary to emphasize their loyalty to the Union in a way that exasperated all ardent Southerners like myself. The bitter feeling lasted. But no matter: Princeton now entered its most “Northern” phase as Southerners sent their sons elsewhere. The proportion of Southerners at the college hovered around ten percent for decades, and students like Virginia-born Woodrow Wilson (‘1879) sometimes felt like a beleaguered minority. As late as 1890, Wilson faced anti-Southern bias as some questioned his fitness as a son of the South to be a Princeton professor. Attitudes gradually softened with the end of Reconstruction, however, and the Lost Cause enjoyed a romantic vogue. Undergraduates founded a convivial Southern Club in 1888. No, the names shall be placed alphabetically, and no one shall know on which side these young men fought. The war was personal for Hibben: he had been born a week after Fort Sumter, and his father, a Union Army chaplain, died of fever at Fort Donelson, Tennessee. Perhaps never before, Confederate Veteran magazine reported, had Northern and Southern names been mingled in a memorial, with no indication of allegiance. 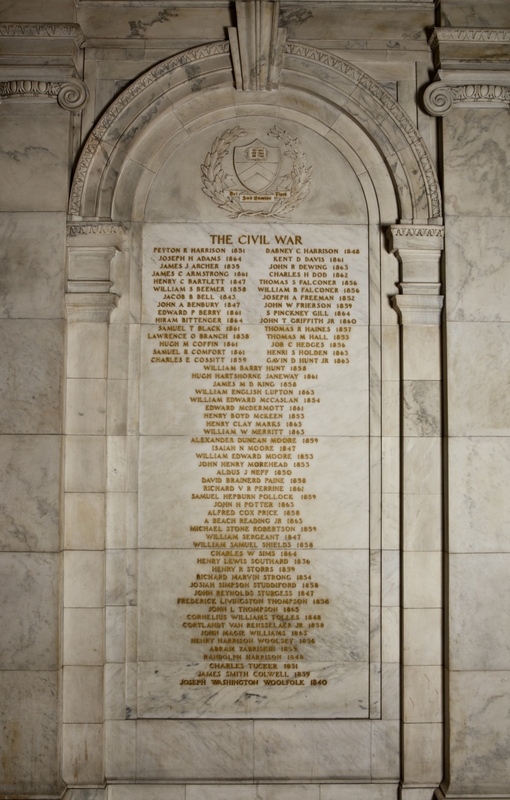 Including Rebel names at all was rather daring: Yale had done so in its Civil War memorial, but Harvard had refused. Today, this handsome memorial in Nassau Hall is Princeton’s chief reminder of its historic contributions to the Civil War era. And yet it bears a tangled legacy: recent research, beginning with my own in 2011 for an article in Princeton Alumni Weekly, points to the omission of a great many Southern names. Generations of visitors to the Memorial Atrium have marveled at the coincidence of there being almost exactly the same number of Northern and Southern dead. It’s a nice story, but in fact mythology perpetrated by leaving many Confederates out. Princeton University Archives staff have discovered that 86 alumni died fighting in the Civil War, 48 of them Confederate soldiers. Perhaps their omission was one final effort, half a century after the Civil War, to downplay the rebel sympathies of so many of Princeton’s sons. Princeton students of the Civil War era are listed in a series of University catalogues, including Princeton University: Catalogue (1896), making these an essential source, but researchers should be advised that they are filled with errors and omissions. Using the resources of Mudd Manuscript Library, I compiled a list of as many Princeton Civil War soldiers I could find, going beyond those that the University had itself compiled in 1920 for the construction of Memorial Atrium in Nassau Hall. My list showed, for the first time, that Princeton Confederates had been under-counted and hence omitted from the memorial wall.